Laura writes in to ask a perennial question: Is it all right to mix and match mid century eras? Readers — What do you think? Pam – I’m at my wits end re: what to do in my kitchen. 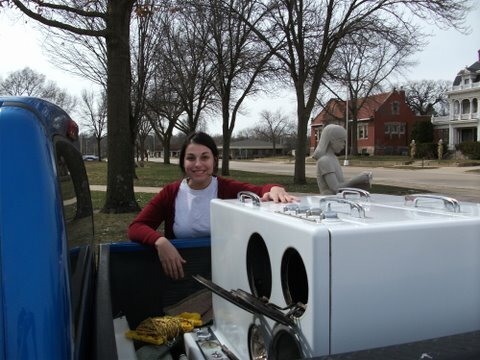 Over the last 18 months, I’ve collected all the fabulous Morton cabinets I need. I LOVE the curves on both the uppers and lowers – to me, they really evoke the cozy 50’s look that resonates with me. I also acquired a great ’54 GE combination two-door refrigerator/freezer in beautiful condition, but unfortunately it does not cool and I can’t find a repair service inside 1,000 miles. These cabinets and this fridge are a perfect combination, but with the fridge not working I had to keep looking for something comparable. 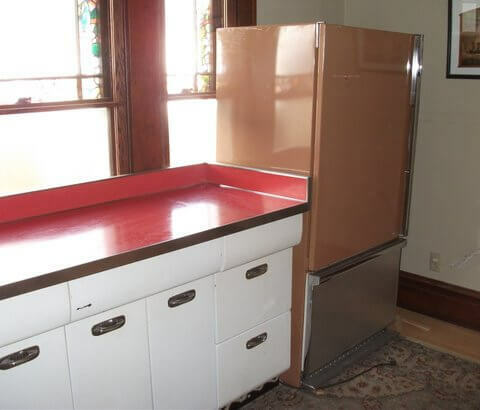 Just last weekend I snapped up a great 1957 GE brown fridge with the revolving shelves I love, but it is a much sleeker design with very straight edges. After a little more research I realized that it is one of those that blends right in with the cabinets – it’s only 24 inches deep. It works great and the features are amazing – pull out bottom freezer drawer, rotating fruit & veggie bins, butter keeper, etc…..but the style doesn’t fit with my cabinets!!! I’m really torn, because I love them both, but combining them just feels very awkward. 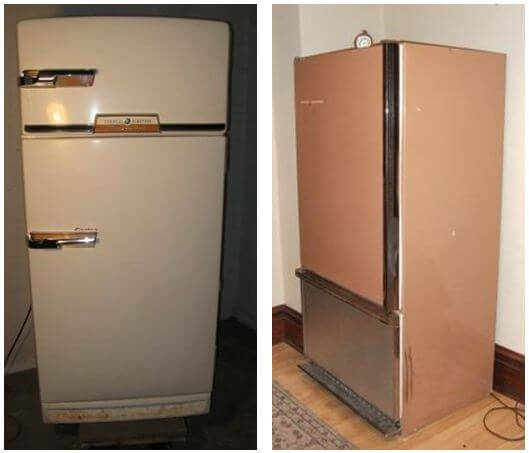 I’m using the brown fridge now and sold the (non-functioning) white 1954-55 GE Combination to a fellow vintage-lover with a good friend in the refrigeration business. I love the features of the mid–mod brown fridge (1957) but feel it just doesn’t fit the early- to mid-50’s era look that I long to recreate. And mostly, both the cabinets and the fridge make great individual “statements”, but combining them sort of diminishes both, if you get my drift. To really do justice to that fridge, though, I would need to trade in my Mortons and get a set with flat fronts and go for the built-in look with soffits and everything. 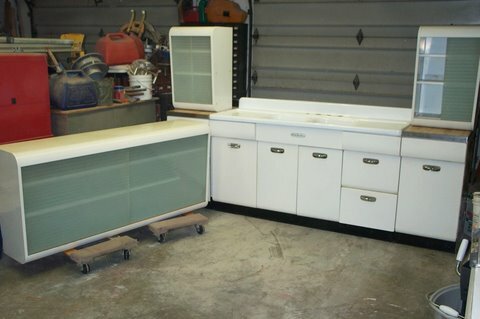 If the Retro Gods would bring me a left-hinged early-50’s fridge with lazy-susan shelves, I’d snap it up and sell the brown fridge, but it seems those left-hinged ones are about one in a hundred, or thousands of miles away….no luck so far. I suppose I’ll have to choose between them, but which to give up (and find more appropriate versions of), and which to keep?!?! So, the question is….is it possible to live in two different eras in the same kitchen??? If you have time to consider my conundrum, I’d really appreciate your advice…. and I’d LOVE for you to post it and draw on all that creative energy from your readers. I drool over the photos of the gorgeous vintage COORDINATED kitchens on this site. I don’t want my own kitchen to fall short if I can help it. “I’m at my wit’s end…” Yup. That’s where Retro Renovating gets us all, at one point or another, Laura. So happy you wrote in. I love your question, because it underscores that there were numerous waves of “mid century” and “mid century modern.” Not one look, but a variety of looks that evolved over the “mid century era,” which most historians bookend from 1946-1963. In fact, your Mortons, I’d say, are quintessentially late-1940s… while your fridge is quintessential early 60s (the GE experts on this site — Patrick? — will know right away.) So, your question neatly juxtaposes “the beginning” and “the end”. Oh and Laura: 18 months to collect your cabinets? A vintage stove (Chambers?) in the pickup truck? YOU GO, GIRL! Matchy matchy mid mod? Or mix and match mid mod mad? I’ll pipe in tomorrow after reading your comments — which always give me new things to think about! Wow, congrats on getting the one you want/need! How exciting! I love the older fridges, but we wound up getting a Big Chill. It makes me smile every day. Wow!! What a great problem to have!! I think,if done very carefully you could mix era’s . . .but again, very carefully and most likely not in areas that might be so obvious, as pictured here. Great finds though! Can’t wait to see how it turns out!! Obviously, the cabinets are perfection & collecting them was a labor of love. I think mixing can work just fine, as long as you keep the look cohesive. Everyone is right about the auto body shop. You should be able to get the fridge repainted on a pretty small budget & since they use a commercial sprayer, the coverage will be wonderful. I am betting that the previous owner did something similar (years ago, of course) if the coverage was nice enough that even your sharp eye didn’t notice it had been repainted. I don’t, however, think I would leave the fridge white. Your original fridge was fantastic in white but I feel like this more modern, streamlined style would like any other boring old fridge in white. If the red countertops are what you will be using, I would personally take a cue from Pam & have the fridge painted aqua. That would make for a lovely and appropriate color scheme! 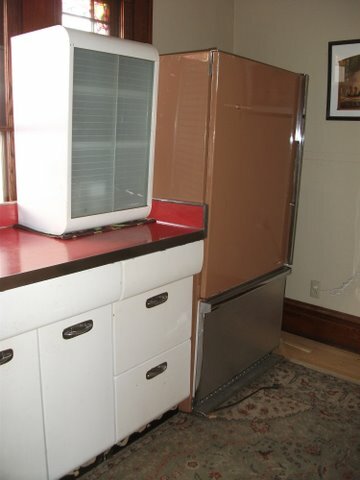 You mind if I inquire as too the value of the 1954 GE combination fridge that you sold? I have one in working condition that I’ve been using since 1993 when I bought my house. I have always wondered if it had any value if I were to replace it.